If you plan ahead and check out all your options, your biggest expense when traveling to Seoul will be your airplane ticket. We have compiled the best options for activities, eats, and accommodations in Seoul for those on a tight budget. 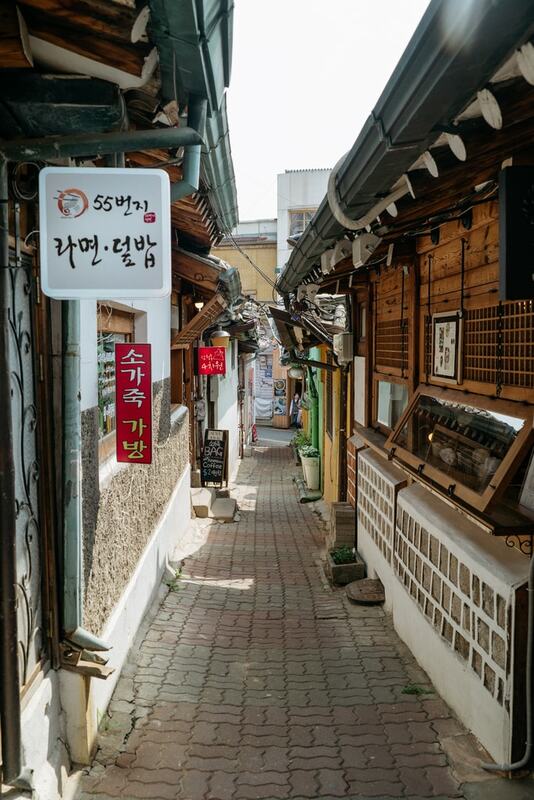 You cannot visit Seoul without strolling through the iconic hanok village of Bukchon. The traditional Korean houses are located in a small area between two of Seoul’s main palaces. Budget travelers will love this location as it is completely free to wander around the narrow alleyways of the village. Countless beautiful photo opportunities, as well as cute shops and cafés, are waiting to be discovered here. There are several museums in Seoul that are completely free of charge. One of the most interesting is the National Museum of Korea. Visitors can learn about Korea’s long history as well as its deep culture. The National Folk Museum of Korea, located next to Gyeongbokgung Palace, also offers free admission. 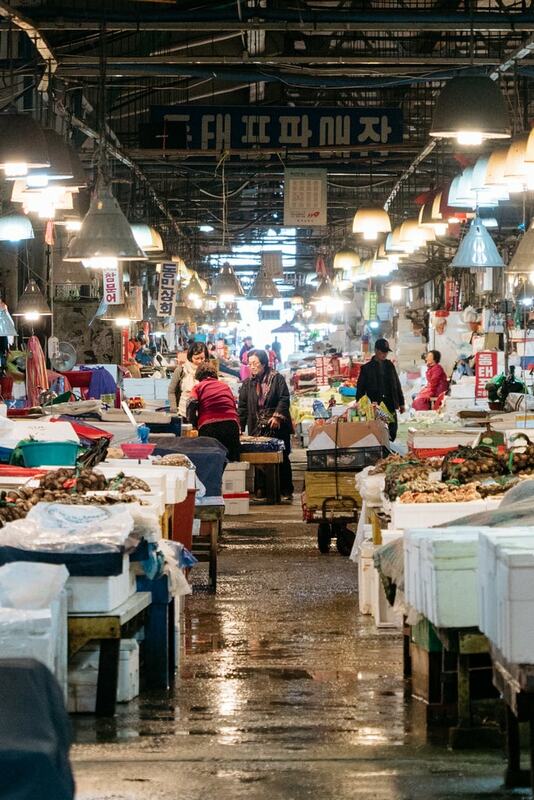 Seoul is home to various markets, but Noryangjin Fish Market is one of the few offering seafood auctions and fresh fish. The market is open from early in the morning until late at night and is always a great place for people-watching and photography. While it is free to watch the vendors go about their business, you can also order fresh fish dishes at a table on the second floor at a reasonable price. You don’t have to be Buddhist to visit a Buddhist temple in South Korea. Seoul is filled with amazing temples with hundreds of years of rich history and fascinating structures and statues. One of the most important temples in the city is Bongeunsa in Gangnam. Built in the Shilla age in 794, the temple is one of the oldest in the country and also houses the tallest Buddha statue in the country. Seoul is filled with quirky cafés offering more than just drinks and snacks. There’s plenty of themed cafés to choose from housing anything from cats and dogs to birds, sheep, raccoons, and meerkats. What’s great about these places is that you usually only pay for a drink and can then stay as long as you wish while playing with the furry or feathery friends. Café areas also a great place to charge up phone and laptop batteries in between sightseeing stops. In general, local Korean food is a lot cheaper than eating at Western restaurants. If you want to spend as little money as possible on food, try street food. 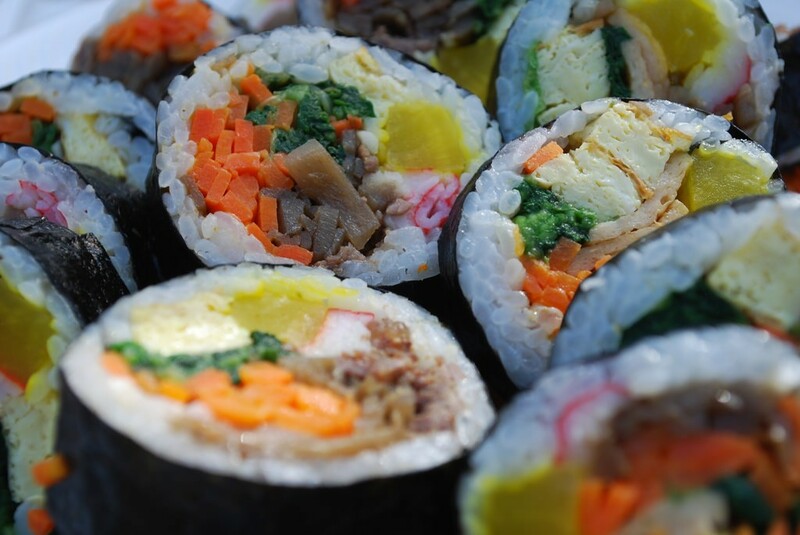 Korean rice rolls filled with various vegetables and meats are the hit of the country. Kimbap is sold on every corner for a few dollars a piece. They are nutritious and also fill you up. Some of the most common varieties include tuna, chicken, or cheese kimbap. For those who like spicy food, tteokbokki is a cheap dish served at a great variety of restaurants in the city. This Korean dish is made of soft rice cakes in a sweet red chili sauce. Not everyone likes the chewy texture of the tteok, or rice cakes, but if you do, this dish will become one of your local favorites. Everyone knows ramen noodles are a popular dish all over Asia. No wonder, because they are easy to make and area also extremely cheap. No matter where you find yourself in Seoul, you can always purchase a cup of ramen at a convenience store or get a bowl at a local restaurant for a few dollars. This bowl of rice with mixed vegetables and topped with spicy chili paste is Korea’s national dish. 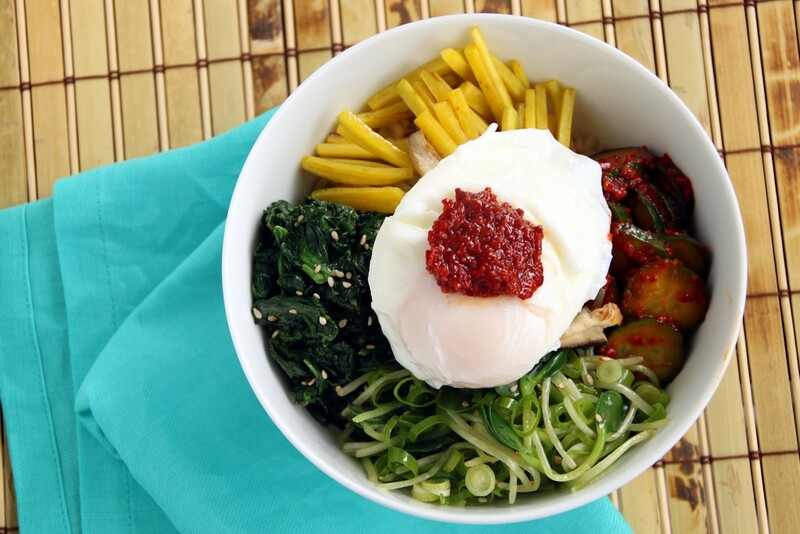 Sold at most traditional Korean restaurants, it’s no surprise that bibimbap is also a cheap meal. It might not be as cheap as the street foods mentioned above, but at $4-$5 it still won’t hurt your wallet. Situated right on Myeongdong Street, this lovely hotel might be located in a premier location but one does not have to pay premier prices to stay here. The hotel has a shared kitchen, shared internet PCs, and it offers luggage storage and laundry services. Rates start at $30 a night. This lovely hostel in Itaewon offers a great variety of rooms for all preferences and budgets. If you’re on a tight budget, you can choose an eight-bed male or female dorm for only $12 a night, while private double rooms go for $48. Itaewon Inn is in an excellent location only a three-minute walk from Itaewon Subway Station. The cheapest accommodation in Seoul are jjimjjilbang, or Korean bathhouses. Once you purchase your admission ticket of 10,000 KRW (US$10), you will be able to spend up to 24 hours at the spa with access to pools, saunas, and hot rooms. The bathhouse also provides comfortable spa wear for anyone and offers common areas with sleeping facilities. While you won’t get much privacy, you can certainly save when staying at a jjimjjilbang in Seoul. Korean spas are located on almost every corner in the city, but one of the most popular ones is Dragon Hill Spa in Yongsan.